The Sweet Cheeks chef talks about barbecue, business, and what she loves to grill at home. Q You run Sweet Cheeks, a barbecue restaurant near Fenway Park that opened in November. Do you ever ditch the smoker for the grill? A All the time. I do this thing we refer to as “yogurt chicken.” [My wife] Kelly is sick of it. I never tire of it. I make a marinade that’s Greek yogurt, honey, jalapenos, cilantro, Madras curry powder, turmeric, scallions, and salt. I put them all in the blender, break down a bird and marinate it for 24 hours, and throw it on the grill. Then I make coconut rice and peas with it. We grill a lot of lettuces, a lot of vegetables. We grill everything. For a go-to side, we grill Asian greens. The more mustardy greens are great — the crispy leaf burns a little on the outside and the stalk becomes really nice. Q Do you have any advice for people who grill for guests in the summer? A Just keeping it simple. Picking things you’d like to eat anyway — nectarines, avocado — and providing a place for them on the grill. And don’t try to grill everything, or the timing is going to be a nightmare. Q Can people legitimately barbecue at home? A I think so. There’s a little more commitment and some planning ahead of time. It’s not the quick “on the grill and dinner’s ready” kind of thing. It’s more of a weekend-warrior thing. It’s attainable. There are a bunch of easy, inexpensive smokers that exist in the world if you’re wanting to give it a go for less than $100. 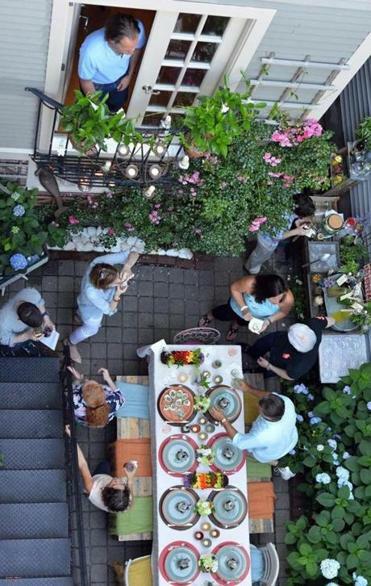 Chef Tiffani Faison and Dominick Doyle team up to create a relaxed garden party. So can you. Q Do people get grilling and barbecuing confused a lot? A Yes. Grilling is a verb, and barbecue is a noun and a verb up here. In the South, you don’t talk about “I’m going to barbecue something,” you eat barbecue. Q How did you get interested in barbecue? A My mom has Southern roots; it’s culture and religion and the sports team in the South. People pick their sides with barbecue, and that becomes a fighting point and arguing point and something people are really deeply rooted in. I ate it a lot growing up, especially when we lived in Oklahoma. It’s ingrained in my family. Q Are there many women in barbecue? A It’s still pretty unusual. Tootsie Tomanetz [at Snow’s BBQ in Lexington, Texas] is still going. She was the first woman who embodied the word “pitmaster,” I’d say. But women are still pretty sparse. I don’t get it. I can make parallels around the whole meat thing, but that doesn’t make sense. A ton of women butchers are coming onto the scene. I would imagine things will change. I’m interested to see where barbecue goes. There’s a proliferation of it. I’m seeing a lot popping up, which is interesting and scary. You don’t want what you do to be played out, to be a trend. Q It’s somewhat unusual to be a female boss in the restaurant business, too. A There was a time when it didn’t faze me — I wasn’t a woman in this, I was just working. As an owner, it feels a little different as a woman. I’ve definitely noticed subtle things I hadn’t noticed before. Overall, I think we have a really great city in terms of that. The way was definitely paved by really strong and talented women. Lydia [Shire] did some really [gutsy things] really early on, which you don’t understand until you talk about how expensive it is to get up and running, and there wasn’t guarantee of a payback. Jody [Adams], Barbara [Lynch], Ana [Sortun]. I’m interested to see more women pushing through right now. One thing I’m definitely noticing is that coming out of culinary school at very young ages, it seems about 50-50 women and men. Then it gets harder and takes more time and everyone gets older, and you see women dropping off. It’s tough, really tough. There’s a woman who works for me — she’s great, she could have a monster career, but she wants to go into PR and have a family. Q Is Boston a tough city to open a restaurant in? A Yes. I think New York is easier, D.C. is easier, Chicago is much easier. We’re on the tougher side. San Francisco is the toughest. People become more risk-averse. Once you’re at the $2 million mark opening a 100-seat restaurant, you have to be guaranteed it’s going to work. Will it sell? Will it have legs? There’s no passion project, hoping this takes off. Part of that, in terms of what we see here, is a lot of young chefs doing riffs on new American, and not particularly high-end versions. Q Is that part of why many chefs with backgrounds in fine dining, yourself included, are opening spots that are more casual? A That’s a huge part of it. Everyone reaches back to the food they love or know or think is an opportunity. Casual models are compelling. They’re a lot of fun. There’s a propensity for higher volume, and you can engineer things really consistently. There’s less room for creative error. There are as many things that are difficult. It’s harder to see when you’re veering off course sometimes. And attracting the type of talent you want is tough when the focus is consistency, not constant change. Q It’s been six years since you appeared on the first season of Top Chef. Do you still feel the effects? I know you frequently used to do brief volunteer stints in various kitchens for learning purposes but that you stopped after the show aired because it became uncomfortable. A Part of it is my own stuff, I completely and freely admit. Half the time you feel like you’re under a microscope. Then the other half, you actually are under a microscope. People have preconceived notions before you walk in. Then it’s: Let’s see if she really has it. . . . It’s hard to ignore how much it does for your business. That alone makes it incredibly compelling. But it’s hard to distance yourself from it ultimately and find an identity that’s not intertwined. Devra First is the Globe’s restaurant critic. E-mail comments to magazine@globe.com.